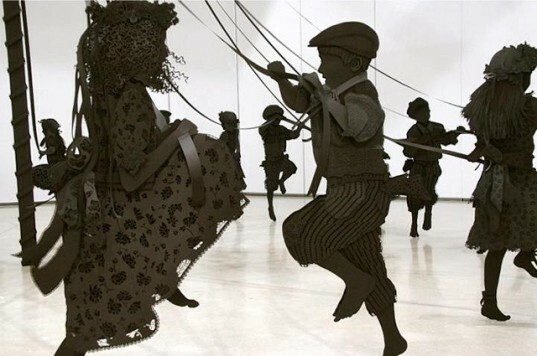 Artist Kristi Malakoff is the creator of this brilliant paper installation depicting a scene of children dancing around a traditional Maypole. Constructed entirely from black paper and foam, the sculpture gives the appearance of silhouettes on a sunny day. It captures a frozen moment in which joyful children take part in a historical May Day tradition, typical in Europe. Rather ironically, the scene is usually a celebration of color and movement. But none of that takes place here. Instead the Canadian artist challenges the “entrenched symbolism” through her hand-craft, which is intricately detailed on a massive scale. Take a look at her website for a peek at more of her work. 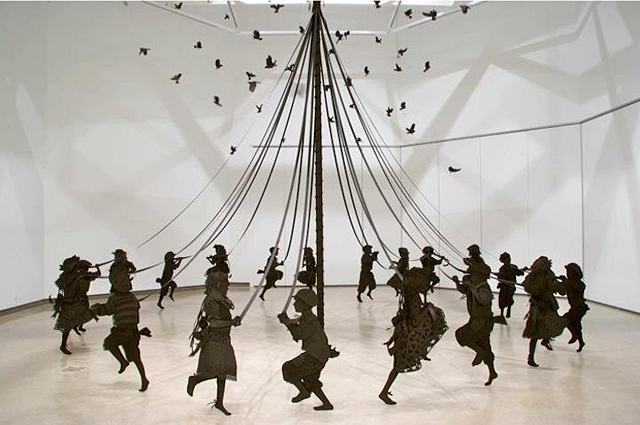 Artist Kristi Malakoff is the creator of this brilliant paper installation depicting a scene of children dancing around a traditional Maypole. Constructed entirely from black paper and foam the sculpture gives the appearance of silhouettes on a sunny day. It captures a frozen moment in which joyful children take part in a historical May day tradition, typical in Europe. Rather ironically, the scene is usually a celebration of colour and movement. But none of that takes place here.